When people talk about the taxi service in Macau, many will share stories of their being scammed by dodgy drivers. On Facebook, a group called “Macau Taxi Driver Shame”, created on June 30, has already attracted around 800 members, who have each shared their experiences on how they fell victim to the cheats and tricks of the taxi drivers in Macau. Visiting the page, people can find pictures of taxis with their license plates or the drivers’ licenses clearly shown, as well as the stories that are associated with the vehicles. Local resident Andrew Scott, one of the administrators of the group told the Times that what got the group started was a complaint. Andrew Scott, as one of the first people commenting on this post, saw a hundred more comments following his, all talking about the taxi issue in the city. The group was able to attract 500 members in just two days after its creation. 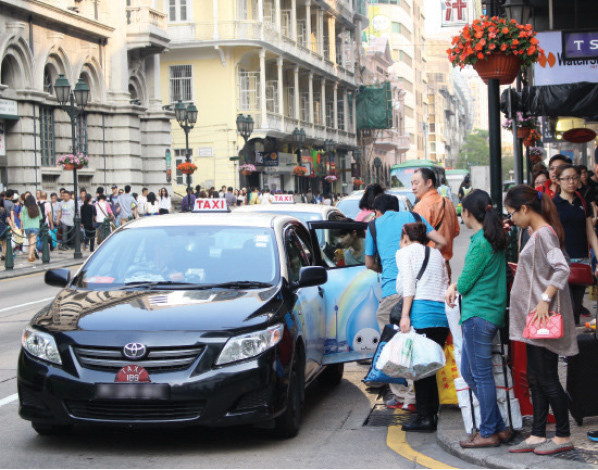 Andrew Scott argues that the rogue taxi service is an issue that affects everybody in Macau. And there is, he believes, a huge amount of community support for finding a solution to the problem. Moreover, he thinks that if the Macau government wants the region to become an international tourist destination and diversify the city’s economy, it has to fix the “face of the city”. He believes that cleaning up the taxi industry will be a very practical measure for the government to present a good image of Macau to the rest of the world. Although he noticed that the authorities have already taken actions to tackle dodgy drivers, Andrew Scott believes that the officials can only claim they have done their jobs when there are no more complaints surfacing. For residents and visitors who want to catch a taxi in Macau, Andrew Scott has offered some advice. If the passenger does not speak Chinese, Andrew Scott recommended them to have the Chinese address or name of their destination and show it to the driver. He also reminded people to ask the taxi drivers to turn the meter on if they did not do so. Even if drivers refuse to turn on the meter, Mr Scott has given an example that shows a rather interesting solution to this scenario. “One of our members in the group, who is actually a very respected person in the city in a senior role, said that what he did was ask the taxi driver to take him to the destination. If the driver doesn’t turn the meter on, when he gets there, he says ‘thank you very much’ and gets out of the taxi and leaves. Andrew Scott said that although he does not encourage people to try this tactic, it is, he thinks, an example of how frustrated people are done with the taxi situation in Macau. As for his suggestion for the government, Mr Scott said there has to be a very strong regulatory authority and a well-publicized phone number for people to report any taxi scams. He also thinks that a fine is not going to stop drivers from tricking their passengers. Rather, he thinks that it would be more effective if the penalty for scamming passengers would be a temporary loss of license. The taxi shaming group administrator said that they are waiting for more people to contribute to the group and tell their story before going to the relevant public department. He also hopes that more Chinese speaking members can take part in the group and have some Chinese media report on the issue. He said that after notifying the government of the group and its stories, he will give the government some time to respond. If no appropriate response is given, Andrew Scott warned that they will go to the next level. Aside from problems with taxi drivers, there is also a problem with incorrect use of words, rudeness,and ridiculous rental prices (both commercial and residential). Then again, it is part of what makes Macau what it is. Still hapenning in Venetian area, I stop a taxi, driver ask me where to go and I said Macao tower he said 200mop of course I refused. It’s a history of science book that explores the question of whether science and technology make consistent forward progress or whether progress comes in bursts related to other social forces…… I tend to think that science is a consistent force for good in the world. I think we’d all be better off if we invested more in science and acted on the results of research !